Our calendar is a Google thing. It has lots of whiz-bang features, but it sure isn't a wiki. Even so, you can still post your own events to it. 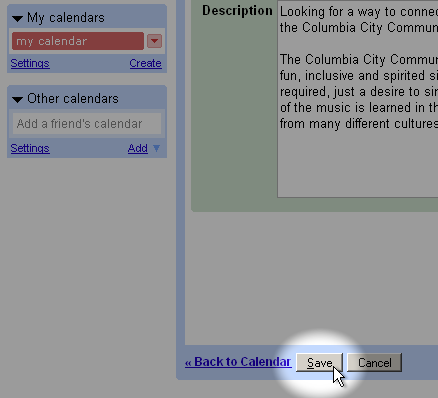 The calendar is a Columbia City resource. Please limit your posts to what's happening within walking distance of the landmark district. log in to Google calendar First you need to sign in with Google calendar. If you've already got a Google account (for Google Reader, iGoogle, Google groups, Wave, Buzz, etc), you can use that. Otherwise you can create one. create your event There are a few ways to create a new event. There's a link at the top left. There's another in the drop-down menu next to your calendar. 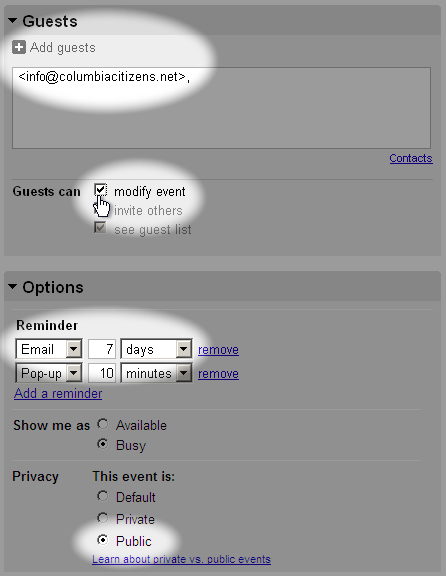 invite Columbia Citizens and set a reminder In the right column of your event, you can invite guests and set yourself a reminder. Click Add guests, and enter ten.snezitiCaibmuloC|ofni#ten.snezitiCaibmuloC|ofni. Please give us editing privileges by checking that box. Note: this is your event, and it makes sense you'd want to invite lots more people this way. Thing is, with this setting, you'll be giving all your other invitees permission to edit too. That might mean accidental changes or deletions. 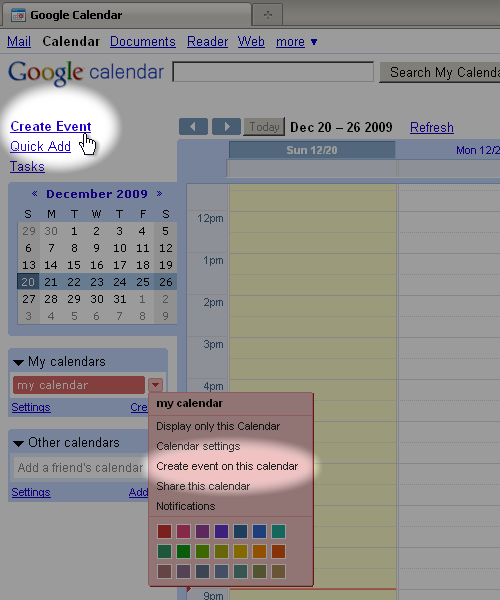 And since Google calendar isn't a wiki, it might be hard to figure out what's happened and to put things back again. Please have your calendar send you an email reminder a week before the event. That way, if your event has changed or just isn't happening anymore, you'll have an easy and timely way to update it. Also be sure the event is set to public. That way it'll show on the community calendar. 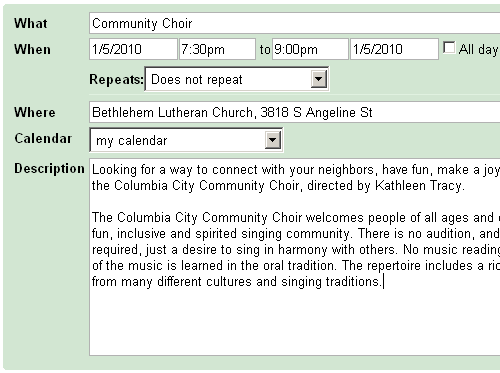 As soon as the site organizer accepts your event, it'll appear on the Columbia Citizens calendar. A week before the event, you should get an emailed reminder. Can I update my event? Yes — you can change any of the event details. Any updates you make to this event on your calendar will also appear automatically in the same event on the Columbia Citizens calendar. Lots of neighbors use the calendar. It's a great place to start. But even more people read our weekly newsletter, the Wikli. Go ahead and post your event there. How else can I keep track of these events? You can layer our calendar in with your own. In google calendar, at the bottom in the left sidebar (where it says "add a friend's calendar") type ten.snezitiCaibmuloC|ofni#ten.snezitiCaibmuloC|ofni.